Maxis is the only integrated communications service provider in Malaysia and the extensive range and reach of our services create a rich customer experience for both consumers and businesses. We leverage on technology to innovate and offer mobile and fixed voice services, messaging, mobile Internet and wired and wireless broadband. We focus on giving our customers the best experience anytime, anywhere and across any device. Join Us! We are the leading communications and Internet service provider in Malaysia, enabling over 13 million individuals, families and businesses to do more in an Always On world. As our customers increasingly immerse themselves in an ever-expanding universe of connected applications, we are obsessed with providing an unmatched end-to-end Internet experience - bringing together advanced, always-on connectivity and always great customer care. We are passionate about what we do, and this drives us to continuously innovate and be admired for excellence. For enterprises, we empower them with New Ways of Working through our integrated solutions, high service levels and tools to digitally engage their customers over mobile connections, fixed lines and a convergence of these two. When it comes to our network performance, we won’t settle for anything other than the best. And that’s why our average is not the average. We take our customers’ high expectations seriously, with an immense amount of investment that goes into our network to ensure that Malaysians have the great Internet experience that they deserve. Our people are our foundation. They drive our success with the MaxisWay that champions passion, positivity and collaboration. The MaxisWay ensures that Maxis remains a dynamic and fun place to work for talented people. Beyond connecting people with our services, we are passionate about leveraging new technologies to make a positive impact in the community in which we operate. Our Corporate Responsibility is committed to promoting environmentally sustainable progress in our community and among our customers and partners. 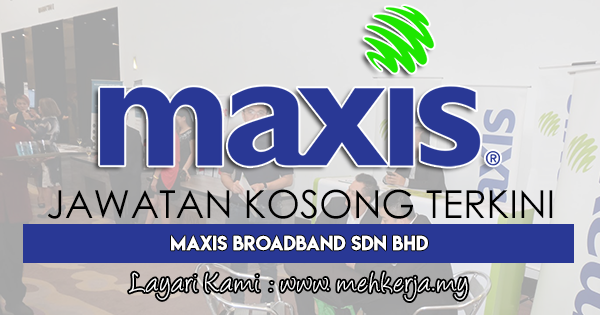 0 Response to "Jawatan Kosong Terkini di Maxis Broadband Sdn Bhd - 19 Aug 2018"